Having a great taste in fashion is a must for every girl and boy. Acquiring new and modern trends in fashion is a goal for everyone. There’s no doubt that trendy shirts, having clever prints, shoes either stilettos or wedges and gorgeous and cute dresses mostly came from Korea, China or Japan. Teens find it cute and trendy, especially the girls. In the Philippines, Divisorias, Baclaran and night markets are very popular. Nowadays, selling and buying trendy clothes online are also dominating in the fashion world. 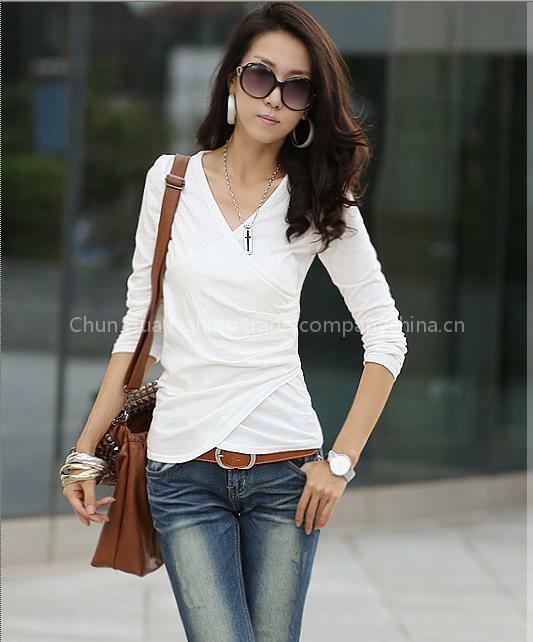 This white long sleeve is perfect for tall skinny ladies. This is simple yet totally gorgeous. This cute dress will totally bring out the best in you. Floral top paired with wavy denim colored skirt. This is totally a head turner. It’s really cute and girly. This dress is very classy at gorgeous perfect for casual meetings. This trend is totally handsome! 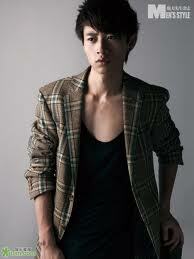 V-neck shirt paired with long sleeve totally rocks. Be a cool girl in school with this printed shirt and colored long sleeve on top paired with denim shorts. Good Chinese cuisines are very hard to find although many Chinese restaurants serve Cantonese foods that taste good but different from an authentic one. Authentic Chinese cuisines are extremely rare because of the variation that the new generation was made. Last Sunday I and my colleagues went to China Town in binondo. We roam around to find the best and budget friendly Chinese restaurant that serves authentic Chiu Chow Style Chinese food, many Chinese restaurants sprouted besides each other, as we pass through the Streets in Sta. Cruz along the Rizal Ave. Toward the street in the front of the Sta. Cruz Church near in the Chinese arch, I found the Kim hiong food garden. They have a lot of customers, many of them are Chinese that live maybe around the vicinity, so I wondered, and we assumed that they might have delicious and affordable foods. We sit on a six chaired table on the middle of the restaurants. We feel very nervous at that moment when we get and open the menu list, it’s because we have no idea on what are the prices of the food they offer. And as we open it, our faces looks like this (O_o). We are very shock and surprise. On the first three pages of the 4 page menu list, the foods is cost around 220- 380 pesos per servings, they serves chicken, beef, pork, fish, seafood’s, vegetable, noodles and fire pot dishes. We are thinking that we might wash the dishes at the kitchen if we order a lot. But we discover that they also offer food for single appetite that cost for 150-220 pesos per plate. The drinks cost around 32- 64 pesos per glass. I’m a food lover but this is my first time to eat Chinese chiu chow food, but I know that this kind of cuisine uses oil for cooking, it’s not recommended for those who are on diet. As they serve our order, we smile like this (:)) because of the serving size, it’s good for 2-3 people with a low appetite, and we are very excited to taste it. Our expectation has not been violated. I ordered beef Brisket with rice, and it taste good! I love the salty, sweet and sour taste of the dish and the chili garlic was awesome! It’s extremely hot and spicy! It compliment with the food. All of us order 6 different kinds of dish. I’m not great in describing it technically but the pictures will explain how tasty the foods are. 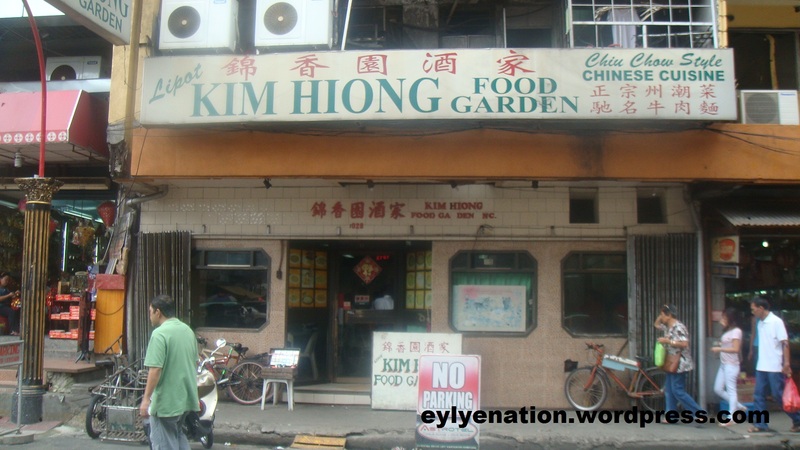 We all know that many variation of sweet and sour recipes pop out in the market, I can easily say that Authentic Chinese sweet and sour dish in Kim hiong food garden was one of the great sweet and sour in binondo. 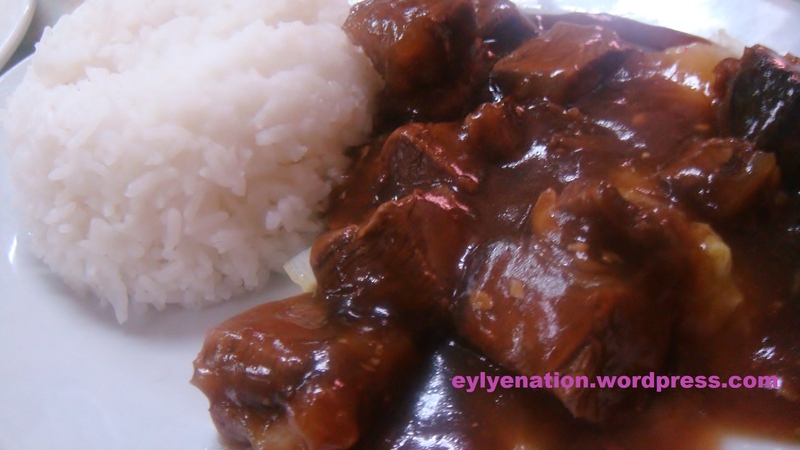 Filipino people are very adventurous in discovering delicious foods. We the Filipino sovereignty loves to eat a lot! We tend to eat at budget friendly resto that serves great and quality foods. We like to eat cuisines that makes our day complete. I suggest you try this one. 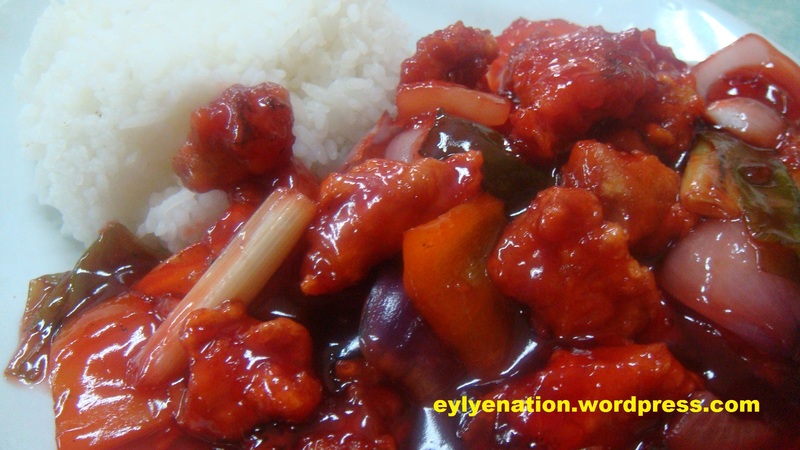 This is the Sweet and sour pork with rice. This is not the typical sweet and sour dish. It has a thick, gooey and creamy red sauce. I’m not really a big fan of this dish but I’ll rate it 5 star ‘cause the taste is awesome, once you’ve seen it the expectation will raise. The colors are well blend to each other that’s why seeing this makes you so hungry, the taste is not that sweet, not that sour and it’s perfect! I know you will enjoy it.